In Africa, the marula is valued so highly, that to give someone the seed kernel of the marula tree as a gift, represents the greatest mark of friendship. 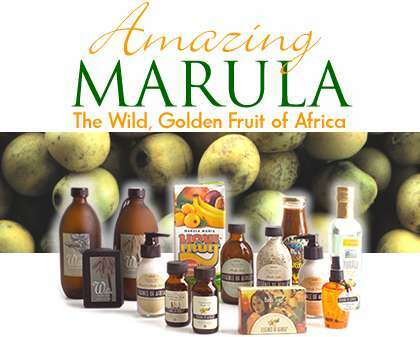 Marula Natural Products Pty Ltd is a high-quality, community-based, value driven African producer of marula fruit pulp and marula oil. These products offer superior health-giving qualities that are inherent in the natural marula fruit and nuts, and are based on traditional knowledge and uses of marula.  The Marula Natural Products range is entirely ORGANIC and natural.  Marula fruit pulp contains FOUR TIMES MORE valuable vitamin C than oranges.  Marula edible seed oil is RICH in nutritious PROTEINS and minerals and contains active anti-oxidants.  Marula essential oil is an effective SKIN CONDITIONER: its cosmetic and anti-oxidant properties soften, soothe and re-hydrate the skin while fighting free radicals.  Marula oil is highly stable, making a PERFECT combinant for beauty products.